Hazard assessment is the basic step in risk assessment in Disaster Management. Hazard assessment helps us to identify the threats and understand their nature and behavior so that we can plan and prepare for the upcoming disasters. "The process of studying the nature of hazards determining its essential features (degree of severity, duration, extent, impact on the area) and their relationship". The hazard assessment should begin with the identification of what natural hazards can be expected and how they might change in the short and medium term as a result of climate change. First of all, all of the potential hazards are identified. Then the areas that could be affected by the hazard are marked, this is called Hazard Mapping. The magnitude, intensity and frequency of the hazards are determined and the causes of the hazards are investigated. Hazards could include earthquakes, volcanic eruptions, floods, drought, cyclones and epidemics. To evaluate the degree of risk and the characteristics and scale of the possible loss from extreme natural events, it is necessary not only to estimate the probability of occurrence but also to investigate the force and duration of the event. It can be made possible using historical data available in written form as well as in the memories of the people of the community. Moreover, scientific data such as meteorological, geological, hydrological, agricultural, environmental and epidemiological data can also be collected from relevant sources and departments for detailed analysis. However, before this detailed study it is necessary to establish how susceptible population groups are to the event and how vulnerable they are to this hazard. If there are no vulnerable populations or elements at the site of the hazard, no hazard analysis is required. This is because in this case the extreme natural event does not pose a threat to human life. These are the first steps in vulnerability analysis, and they are needed before any detailed hazard analysis. 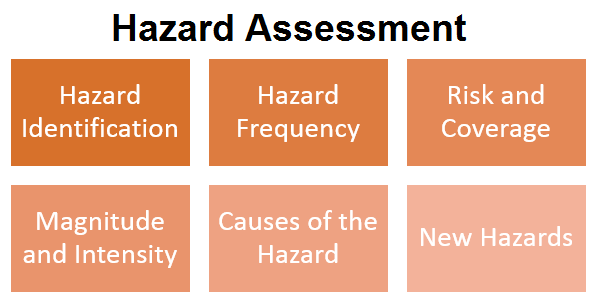 The first stage in hazard analysis is to identify the types of hazards. Depending on the types of hazards identified, the process may need to be continued on a separate basis for each type of hazard or group of hazard types. Earthquakes, for example, require different instruments and specializations for analysis than e.g. landslides or floods. There are many ways to classify hazard types, e.g. natural events occurring suddenly or gradually, of an atmospheric, seismic, geological, volcanic, biological and hydrological nature while others summarize mass movements under the heading of “geomorphological hazards”. Afterwards the identification and characterization of hazard prone locations is undertaken and then identification and determination of the probabilities of occurrence on an ordinal scale (high – medium – low) is completed. The next step is to estimate or calculate the scale (strength, magnitude) of the hazardous event, also on an ordinal scale. Then identify the factors influencing the hazards, e.g. climatic change, environmental destruction and resource degradation, major infrastructural facilities such as dams etc. Natural factors - changes in the pattern of weather leading to new hazards like drought, frequent and extreme flood events. Economic - Fluctuations in the value of currency affecting livelihoods, trade related policy changes, loss of raw materials, industrial damages and destruction. Social and political trends - Changes in policies, Re-locations of people, Conflicts. Industrial hazards - chemical accidents, poisoning. Needs Assessment - What it Contains?